Taipei recently released satellite records that their fishermen were fishing at these coordinates "122° 55' E 19° 59 N" when they were chased by the Philippine Coast Guard and killed one of them. The scene of the crime happened southeast of Batanes Group of Islands. You can see Basco, Batanes there and Luzon Island. 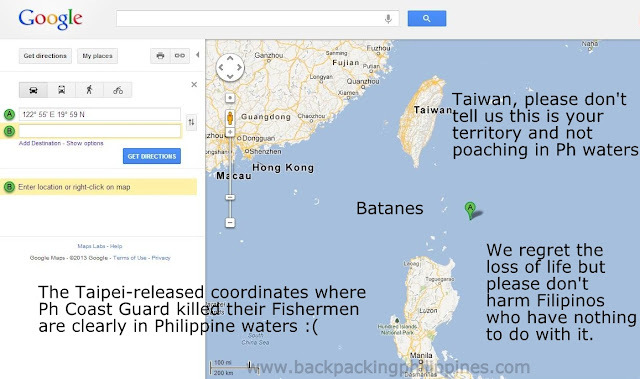 Now, is this Taiwan's territory or just proves further that the fishermen were poaching in Philippine waters? Do the Taiwanese know how to plot coordinates on the map or they're claiming Batanes as part of their territory? Now, if it's true that Taiwan's fishing vessel tried to ram the Philippine Coast guard ship, the shooting may be justified (I said maybe). In time, the video footage and results of National Bureau of Investigation (NBI) will be made known. Let the TRUTH COME OUT, no BULLYING! The Filipino people regrets the loss of life, also waiting for justice. If there's a crime committed, bring the perpetrators to justice. What we cannot tolerate are the attacks of Taiwanese mob on Filipinos working in Taiwan who have nothing to do with the incident. Filipinos are not barbarians, lots of Filipinos killed in foreign soil and yet we do not harm citizens of the country where they died/got killed. To the Taiwanese, please behave like civilized citizens and not bring justice into your own hands. What if you're proven wrong?